The Waves blockchain is ideal for our universal crypto portal thanks to its speed, scalability, straightforward token operations and low transaction costs — amongst other factors! There were a handful of blockchains we could have chosen when designing the HOLDVEST platform, but in the end there was only one realistic option: Waves. Here are some of the main reasons we chose Waves platform for our core token infrastructure. Waves takes a fundamentally different approach to token operations than smart contract platforms like Ethereum. It’s very easy to create tokens — no knowledge of smart contracts or programming is required — and it can be done from the lite client in just a few seconds. That’s important because it’s not just the HDL token (the fuel for our platform) that will need its own token. We’re going to be creating crypto index funds that users will be able to trade in one click, just like they can trade index funds and ETFs in the conventional financial markets. Waves is ideal for that kind of use case. Waves supports huge transaction volumes — an order of magnitude more than any other blockchain. That’s important for us because our business model entails accepting small amounts of HDL tokens for every operation on the platform (or else buying them off the open market with trading fees), and then burning 50% of these. We cannot afford to be in a situation where the blockchain is backed up with unprocessed transactions — something that repeatedly happens with Ethereum, for example. Moreover, we’re going to be conducting a series of airdrops of HDL tokens to WAVES holders as part of our outreach and publicity. Waves is the perfect blockchain for that. In fact, it’s arguably the only blockchain fit for purpose. One recent airdrop distributed tokens to over 59,000 wallets in just 407 seconds, or 145 tx/s. That’s simply incredible and no other blockchain platform can touch it. Similarly, Waves has low transaction fees. It costs just 0.001 WAVES per tx, currently around $0.007. When you’re sending lots of transactions, the fees all add up. Every time someone pays a commission fee in HDL on our platform, that will entail a Waves transaction. The fees involved in that process would kill our profitability on any other major blockchain. Whilst we could mitigate that if we had to, it’s nice not to need to worry about it because it means we can also bring substantial transaction volumes to Waves and support miners. Waves’ decentralised exchange offers the best of both worlds, being both extremely fast and highly secure thanks to its centralised matcher nodes but on-chain settlement. That has huge potential for peer-to-peer trading, something we’ll be exploring a little way down the line as our platform gains traction. Waves has a fantastic community full of helpful and knowledgeable people. The platform is still fairly young — just over two years old — and, whilst rapidly growing, the community still feels cohesive enough to be a very strong resource. Moreover, Waves has made a great effort to drive forward its ecosystem as a whole, rather than simply focusing on technology, and there are many initiatives that seek to help entrepreneurs and leverage that pool of talent and commitment. The Waves Lab incubator is one such organisation, and we’re very pleased to have their expertise behind us! Additionally, Alexey Koloskov — a long-term member of Waves and the developer who designed and built the DEX — is a key advisor for our team. That’s just for starters. In the future we know we’ll be able to leverage more of the features Waves has planned, like smart contracts, atomic swaps and a bunch of other cool stuff. Most of all, we’re looking forward to adding value to the Waves platform, just as Waves adds value to HOLDVEST. 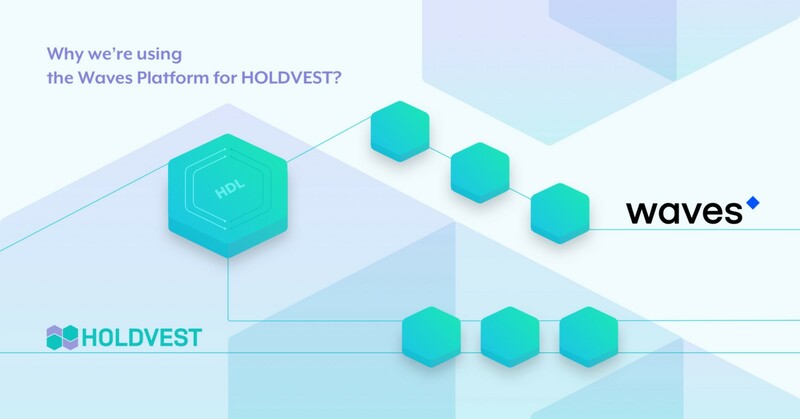 Join HOLDVEST Pre-Sale now with unprecedented 35% discount for HDL token.